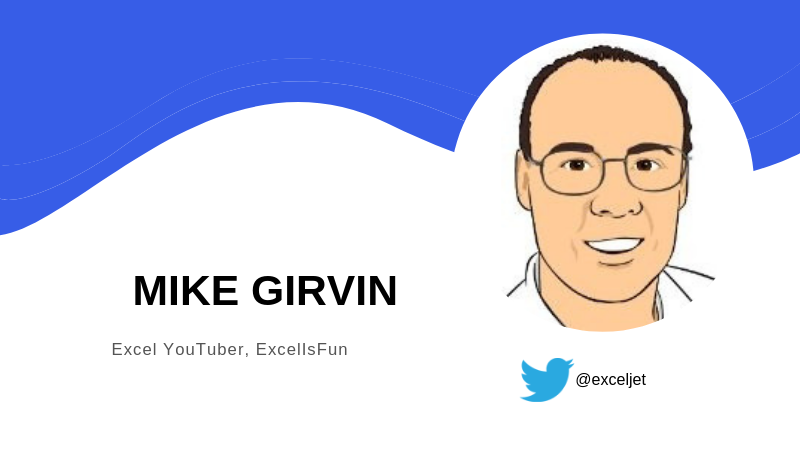 Mike Girvin has been delivering free Excel education via YouTube since 2008, with more than 3,000 videos, 100 classes and playlists, and 500,000 subscribers. His excelisfun YouTube channel delivers free videos, Excel magic tricks, pdf notes, Excel and Power BI files and practice problems on a wide range of concepts and features. He has been a Microsoft Excel MVP since 2013 and an instructor at Highline College since 2002. Girvin spoke with Excelchat about Excel’s Golden Rule, student needs and why Excel has been a game-changer for business analytics. Let’s start off by asking why you believe Excel is fun. There are two reasons: Excel’s Golden Rule, and it makes our jobs easy! The original idea behind the spreadsheet that Dan Bricklin and Bob Frankston invented back in 1979 was what is called Excel’s Golden Rule. It states that if a formula input can change, put it in a cell and label it. Then refer to it in a formula with a cell reference. This enables the true magic of Excel to happen: Change a formula input in a cell and the whole Excel solution updates. All of us Excel users have leveraged this magic to create efficient Excel solutions, and when we change an input and everything updates, we achieve efficiency and fun with Excel. The second reason is that Excel makes our jobs easy. Math, data analysis, accounting, finance, simulations and economic solutions and models can be created so much faster when we use Excel. And, when you get good at creating Excel solutions, you start to think in Excel rather than in traditional math or data analysis, and the fun level jumps exponentially. It is the power and beauty to create efficient and effective solutions with such speed and elegance that makes Excel fun. Further, because so much of the working world is required to know Excel, and the majority of those workers do NOT know Excel well, it is one of the easiest ways to shine in a job interview or at work. Excel gurus rarely get laid off and are often the first to get promoted. When students, viewers or others come to you seeking help, are there common themes for what they need? First, they have lots of data from different sources and they need to create reports or analytics. They have tables of calculations like budgets, cost accounting and financial calculations. Sometimes the solutions that they have created have problems, often simple problems like with number formatting. Some are looking for help with advanced formulas like in spreadsheets, M codes or DAX. Many students want to learn the basics of Excel because their educational programs did not train the students with the required Excel skills. Business analytics is a booming part of digital transformation. What role is Excel playing, can it play and will it play in BI and data analytics? Business analytics including business intelligence (BI) is a very broad category that includes many different types of modeling and solution building. Excel’s standard features like spreadsheet formulas and standard pivot tables have been a mainstay for decades for business analytics. Excel’s new Power Tools and Office 365 formula calculation engine are newer features that extend Excel’s business analytics ability to new and amazing heights. Spreadsheet formulas, standard pivot tables, charts and conditional formatting are used for many data analytics and visualization tasks performed on small data sets. Spreadsheet financial functions have been around for decades and are always used in financial analysis. Statistical functions and features were completely re-invented in Excel 2010 and later versions and provide significant spreadsheet formula power for statistical analytics. Regression, forecasting, linear programming, simulations and other analytic tasks are easily done in the Excel worksheet. Power Query has completely transformed the way we extract data, clean and transform data, and create efficient and effective data models for our data analysis and BI needs. Power Pivot and its internal columnar database allow us to exceed the Excel worksheet limit of a million rows of data, and load millions of rows of data for our analysis. DAX formulas (in both Power Pivot and Power BI) provide business-specific calculations that are not available from worksheet formulas or from the calculations available in a standard PivotTable. Further, DAX formulas work with the columnar database to work efficiently on Big Data. The Power Tools (Power Query, Power Pivot and DAX) have transformed Excel’s ability to create refreshable reporting and dashboarding solutions. Power BI Desktop is a free download that works with Excel and provides almost the identical Power Query, DAX and columnar database tools as in Excel, but provides more varied visualizations and dashboarding abilities. You’ve chosen YouTube as your primary medium. Can you share a bit about making that choice? What are the advantages of focusing on YouTube? When I joined YouTube in 2008, it was the most universal tool to deliver videos to the world. Now in 2019, YouTube is the second-most-used search engine in the world. Further, since my goal is to provide free educational resources to the world, YouTube, rather than another paid course management system, still seems to be the best way to reach the most humans on the planet. Although I provide free books and other free Excel and Power BI resources through a different website, it all flows through YouTube. What’s on the horizon for Excel? What do you predict will be the next big things? Two BIG things are in the future for Excel users. Excel Dynamic Array formulas and functions will transform how we build Excel solutions, from budgets to financial models to formula reporting and analytics solutions. Second, the standard PivotTable took about a decade to achieve prominence as an awesome BI analytics tool. Even though the new Power Tools in Excel far exceed any previous BI analytic tool ability, they have not been widely adopted. But without a doubt, as all of us bloggers and analysts continue to communicate the power and efficiency of the new Power Tools, it will be the next big thing in Excel (and Power BI Desktop too). Excelchat offers on-demand solutions for Excel users who need an answer in the moment. To learn more about our Excel services, contact us today.